Vampire Trivia - Who am I? Can you figure out which bloodsucking Princes of Darkness are described in this Vampire Trivia Who Am I printable game? 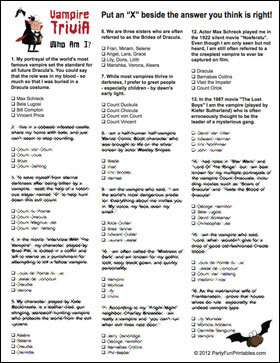 How it's played: Players (or team of players) must read the ominous descriptions of many vampire characters, and select the correct answer. Putting an "X" beside an option is easy. Knowing the correct answer is not! My portrayal of the world's most famous vampire set the standard for all future Dracula's. You could say that the role was in my blood - so much so that I was buried in a Dracula costume. Answer: Bela Lugosi played Dracula in the 1931 version of the movie, creating the image that would be most frequently associated with this famous vampire. 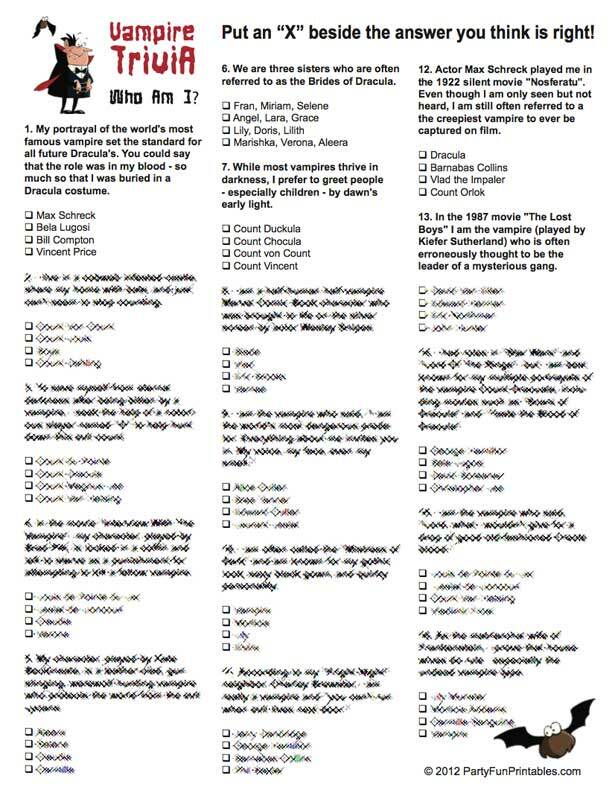 Preparations are easy: Just print out as many sheets as you need. Have some scary music play on the background to add to the atmosphere. Have a 'Bloody Mary' ready for the winner(s)! Or any prize of your choice.